Capital Link would like to congratulate Avenue Community Development Corporation with Legacy Community Health, Blackstone Valley Community Health Care, Esperanza Health Centers, and First Choice Community Healthcare for being awarded Healthy Futures Fund (HFF) planning grants provided by The Kresge Foundation and Local Initiatives Support Corporation (LISC). 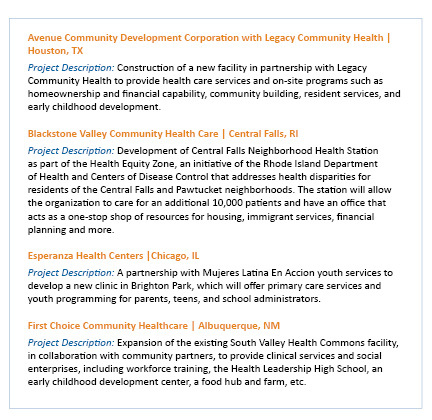 The health centers were selected for their ability to demonstrate plans for innovative, groundbreaking capital projects (described in the box below) that involve unique collaborations with community partners to expand access to health care while also addressing at least one other critical community need, such as affordable housing, access to healthy food, job training, schools, elder care, and other community wellness projects. Prior to receiving the grants, all four health centers participated in a free HFF Readiness Program, offered by Capital Link and sponsored by LISC and Kresge. Capital Link provided program participants, a group of 10 centers selected through a competitive application process, with technical assistance to advance their capital project plans and prepare for additional funding. A HFF partner, Capital Link developedthe Readiness Program based on our 18 years of planning and development experience in support of FQHCs nationwide. A $200 million initiative formed by the LISC, Morgan Stanley, and Kresge, HFF utilizes New Markets Tax Credit and loan capital to improve community health by expanding healthcare access and addressing social determinants of health. Read more here. On November 17th, the U.S. Department of the Treasury’s Community Development Financial Institutions Fund announced the awardees for the combined 2015-6 round of New Markets Tax Credit (NMTC) allocations. The awards, which were increased to an historic high of over $7 billion, are aimed at revitalizing low-income communities and increasing economic opportunity nationwide. The 120 Community Development Entities (CDEs) that received these awards are actively seeking projects to finance. This is great news given that many CDEs are interested in providing financing for community health center expansion and renovation projects. For health centers needing additional funding for a project, NMTC could be the answer. NMTC financing is a critical source of low-cost capital and equity for health center facility projects—often subsidizing project costs by 20% to 25%. In order for health centers to obtain credits with a CDE, they must demonstrate a high level of project readiness and be able to communicate the merits of their projects to CDEs with allocation. Furthermore, the process of structuring and closing an NMTC transaction is complicated and the terms, benefits, and fees offered to borrowers vary widely. Capital Link has extensive knowledge of the NMTC financing process and strong connections with virtually every CDE interested in working with health centers. Capital Link can provide assistance with the complex process of completing a NMTC transaction. We’ve also helped many health centers with combining NMTC financing with HRSA capital grants—an excellent option, especially for projects of $5 million or more. Our lending affiliate, Community Health Center Capital Fund, can provide leverage loans to complete the NMTC financing package, as needed. Of the nearly $1 billion in financing obtained by health centers through the NMTC program, approximately 60% was raised with Capital Link and/or Capital Fund assistance. For help in determining whether NMTC financing could be a good fit for your health center, please contact us here. To learn more about the NMTC program and how it works, click here to access Capital Link’s three NMTC publications and here to access a recording of the recent webinar, Financing Health Center Projects with New Markets Tax Credits.